ROCHESTER, N.Y. -- Several chronic lymphocytic leukemia (CLL) patients at the Wilmot Cancer Institute took part in two groundbreaking, nationwide phase 3 studies that are changing the way doctors treat the disease. The positive results are being reported this weekend at the 2018 American Society of Hematology (ASH) annual meeting — and will immediately impact CLL patients in the Rochester region and across the U.S., said Paul Barr, M.D., director of Wilmot’s Clinical Trials Office. 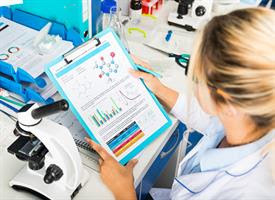 Already the median overall survival for patients with CLL has tripled during the last 30 years, thanks to better understanding of the disease biology and new drug development, and the latest clinical trials will result in further improvements, Barr said. The new studies compared the current standard treatments for front-line chemotherapy with regimens using a combination of ibrutinib, a drug that targets BTK, a critical protein in CLL, and rituximab, a type of immunotherapy. Ibrutinib is taken as a pill and is often less toxic than chemotherapy. One study was designed for patients younger than 70 years old, while the other was designed for older patients. The clinical research represents the first time ibrutinib/rituximab has been directly compared to the most aggressive and promising therapies available today. Both studies showed that ibrutinib provided a longer time of remission compared to chemotherapy. The same drug has been extensively tested in certain patients with relapsed CLL, and was also shown to be safe and effective.